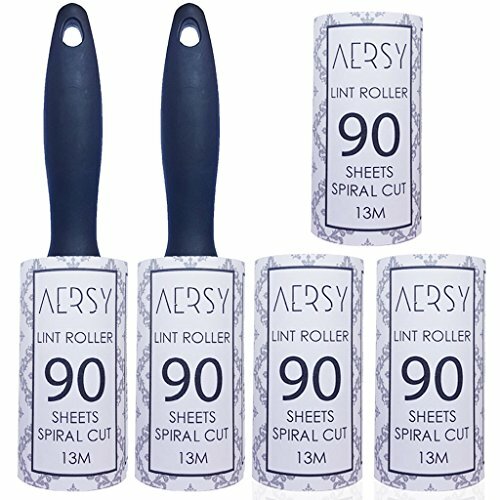 AERSY Lint Roller Set. 450 Sheets! 90 Sheets Per Roll. 65 Metre Total. Easy Peel, Extra Sticky. 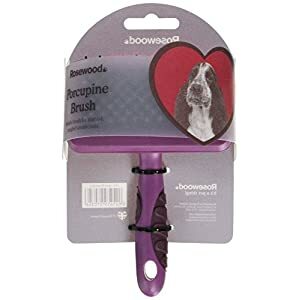 Quickly removes Pet Hair, Dirt, Dust Fluff from Clothes, Car Seats, Upholstery Floors. ❖ MORE SHEETS GREATER LINT REMOVAL: Enjoy easy and effortless hair and lint removal with the ultimate lint roller pack. Our fluff remover rollers have 90 sheets per roll and unlike others they will last you even more. With 450 sheets per pack your ready to go. ❖ EASY PEEL STICKY SHEETS: Designed to facilitate your life to the fullest, these lint rollers have a diagonal cut that makes peeling off extremely easy. Being super sticky, they will catch and hold even the tiniest lint or fluff out there. Just peel, roll and check the results! ❖ PROTECTIVE PLASTIC COVER: Each roll comes with a plastic cover sheet. Use it to protect each refill after use and keep it clean till next time. No more dirty lint rollers touching your clothes. Ideal for traveling, holidays, outdoors, and even office work. How To Remove Dust, Lint, & Debris From Your Clothes Effortlessly? With AERSY Lint Rollers, Of Course! … sofas full of pet hair? … lint ruining your sharp image? Worry no more! 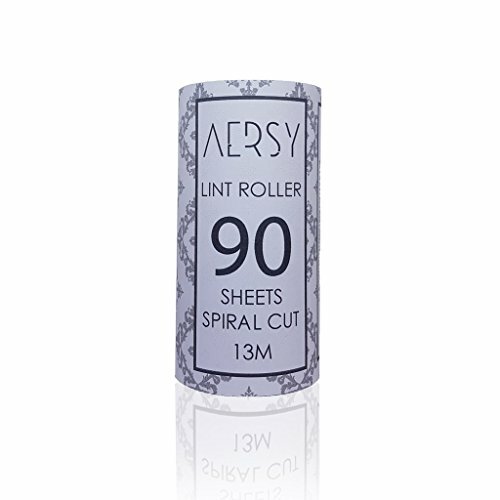 With AERSY lint rollers you are one step closer to a lint and fluff free life. These lint rollers will get the job done for you! Hassle free lint and dust removal is for real! 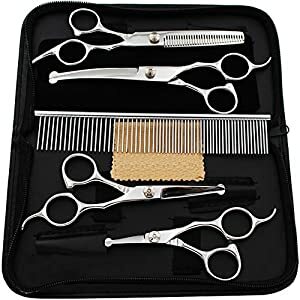 We Made Hair & Lint Removal Easy For All! 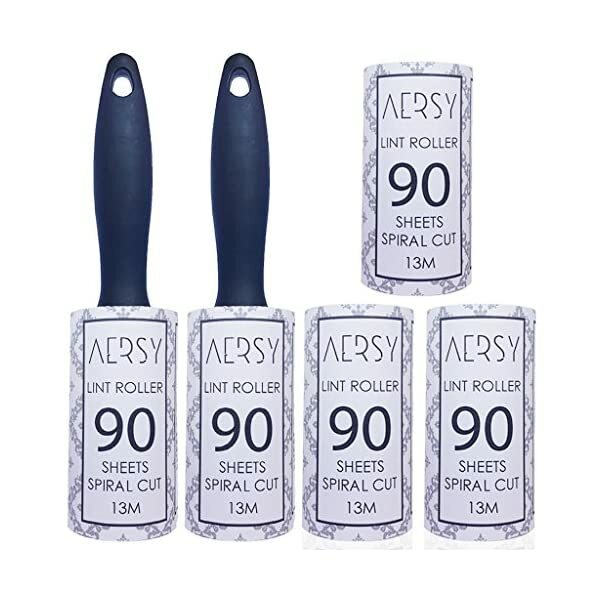 Grab Your AERSY Lint Roller Today! Being compact, lightweight, portable and equipped with a plastic cover this lint roller travels together with you. Perfect for work, business meetings, holidays, client appointments, and home use as well. With more sheets per roll, 90 to be precise, our lint roller set is here to satisfy even your most demanding cleaning needs. Each pack comes with 4 extra refills and a protective cover. Being reusable, you’ll use this lint roller for the many years yet to come. Works miracles on more than a few surfaces and types of garments, like linen, cotton, velvet, silk, floors, sofas, vintage upholstery, wooden surfaces, walls, pool tables, pockets, and even wool carpets. · … clean up spilled glitter and craft supplies. · … dispose a pesky bug. · … remove dust and crumble from your handbag. · … clean your kitchen drawers or car seats. · … reach all hard to get crevices. 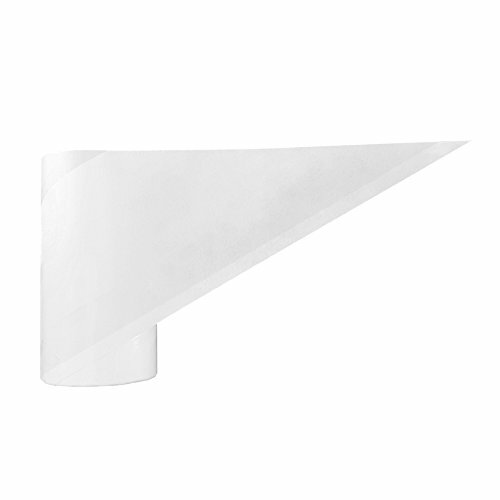 · … eliminate tiny broken glass shards left in the back of. · … pull dust from rugs and furniture. · … remove dandruff from clothes. · … dust your drapes or your kid’s stuffed animals. ❖ MORE SHEETS GREATER LINT REMOVAL: Enjoy easy and effortless hair and lint removal with the ultimate lint roller pack. Our fluff remover rollers have 90 sheets per roll and unlike others they are going to last you even more. With 450 sheets per pack your ready to go. 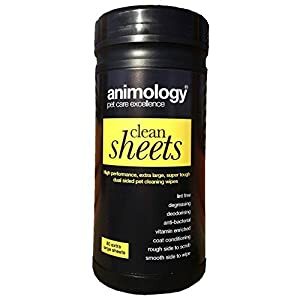 ❖ EASY PEEL STICKY SHEETS: Designed to facilitate your life to the fullest, these lint rollers have a diagonal cut that makes peeling off extremely easy. Being super sticky, they are going to catch and hold even the tiniest lint or fluff out there. Just peel, roll and check the results! ❖ PROTECTIVE PLASTIC COVER: Each roll comes with a plastic cover sheet. Use it to offer protection to each refill after use and keep it clean till next time. No more dirty lint rollers touching your clothes. Ideal for traveling, holidays, outdoors, and even office work. 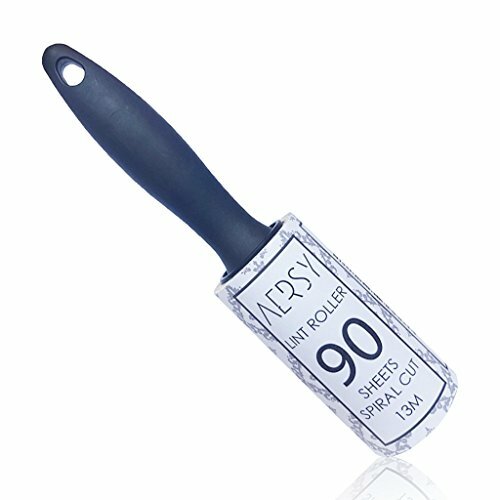 ❖ EXPLORE ITS VERSATILE ROLE: This adhesive lint roller can be used on more than a few surfaces. Perfect for a wide variety of clothes, like suits, dresses, sweaters, pants, shirts or even furniture and upholstery. 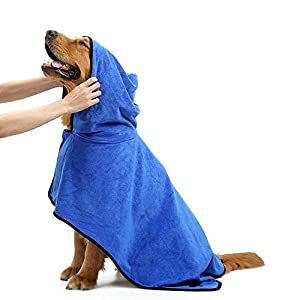 Ideal for pet owners! Remove pet hair from around the house. ❖ WON’T TIRE YOUR HANDS: Thanks to its ergonomic and well designed handle, you may rest assured that this lint roller kit will never tire your hands even as the usage of or holding. Worry no more about lint refills falling off the handle either. We have taken care of this as well.